Returning after nearly three weeks in Europe, I am astonished by the prevailing political currents in the countries historically closest to Canada. In the United Kingdom, the government went for an increased majority against an absurd opposition leader who admires Irish and some Islamic terrorists and whose political heroes are Fidel Castro and Hugo Chavez. As readers know, the result was a loss of the majority and the reconstitution of the government with the support of the Democratic Unionist Party. This was the arch-Protestant political movement of Northern Ireland, which has fortunately settled down a good deal since the piping days of its founder, the Rev. Ian Paisley, who generated severe riots for decades with his inflammatory aspersions of Catholicism. The author of the redundant, poorly fought, and unsuccessful British election, Prime Minister Theresa May, took her trip to the political woodshed with stoical British resolve, kicked off the new era with a one billion pound reward for Ulster, and handled questions in the House of Commons quite doughtily. No leader of the British Conservative Party has left that post altogether voluntarily since Stanley Baldwin took a good look at the Nazis and retired to the Midlands in 1937. (When the German air force bombed his family iron business in 1942, Prime Minister Churchill said, "That was very ungrateful of them.") Even the party's greatest modern leaders, Winston Churchill and Margaret Thatcher, were effectively given the high jump. If there were an obvious successor (Boris Johnson, whose elevation I have long predicted, still unsettles many people), May would be out now, like Anthony Eden after Suez. But the party grandees and elders seem to have determined to allow May to continue, as long as she doesn't drop the ball again, and to lead Britain through the Brexit negotiations. There is plenty of precedent for British governments being led officially by people who do not really dominate their cabinets and caucuses, including the Duke of Portland (twice), the Earl of Aberdeen (1852-1855) overshadowed by Palmerston, Gladstone and Russell (who between them served eight terms as prime minister), and New Brunswicker Bonar Law (1922-1923). If May, whose regime, apart from Johnson, is not loaded with obvious talent like the governments just cited, can keep her head down and deal effectively with the European negotiations, she will at least serve four years. At the moment, as my friend Mark Steyn has pointed out, she may look more like Kim Campbell than Margaret Thatcher, but she could yet prove a semi-survivor. As Britain readies for the humdrum, France has embarked on one of her periodic political bizarreries. 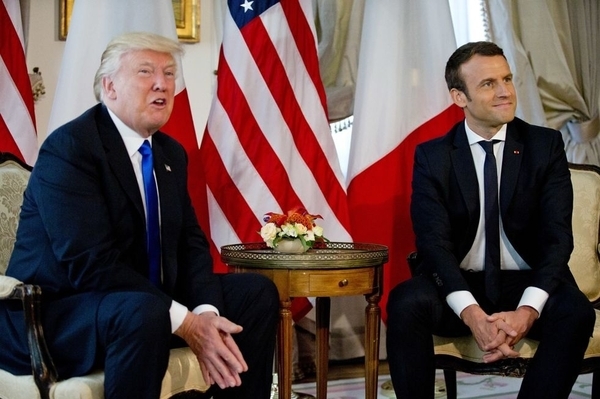 The tottering downward movement in the presidency of the Fifth Republic from the august General de Gaulle to Pompidou, Giscard d'Estaing, Mitterrand, Chirac, Sarkozy, and the hapless Francois Hollande, caused the French to do the Americans one better. Not only did they elect someone who had never contested political office before, the 39-year old Emmanuel Macron, they smashed the traditional parties and delivered a parliamentary majority, albeit with a turn-out of only 35 per cent of eligible voters, to a party of rank amateurs that the new president only founded a few months ago. He promises sweeping changes, despite a clichéd straddle on most issues, including over-fervent enthusiasm for Euro-federalism and alarmist views of climate change. The test will come in the autumn (all France goes on holiday in August), when France's militant unions organize resistance to Macron's labour market flexibility measures and deregulation. If Macron has the solidity and powers of leadership of de Gaulle during the general strike in 1968—when he threatened fairly explicitly to use the army to break illegal strikes and assure a free election—Macron may revive France's drooping fortunes. If he waffles, a General Boulanger without a uniform or white horse, the steep decline of France will continue, perhaps into a terminal phase. But the laurels for the most amazing political spectacles mounted by an important country are not to be wrested from the United States that easily. The debacle of health-care reform has shamed almost the whole political class and has opened up for all to see the stark dysfunctionalism of the American system. The president did not lead effectively, never showed a thorough grasp of the complex issues, and has been partially off balance throughout his term because of the obsessive mudslinging of the Democrats and most of the media, especially over the monstrous canard of collusion with the Russians in the last election. There is not a shred of evidence to support any of it, and the Bushes, Clintons, and Obamas have gone, but the rest of the swamp-life Trump assaulted abides. The desperate struggle with the Democratic and many of the Republican legislators and 80 per cent of the traditional national media continues. The conduct of the Republican senators and congressmen, who screamed from the roof-tops for seven years that they would repeal Obamacare, is sickening. Obama vastly expanded Medicaid (medical care for people of modest means), and the Republicans choked in the clutch, having neither the political will to roll it back and properly reform the system, nor the courage to impose the revenue collection necessary to pay for it. The Democrats and their jackal media just continued to fabricate malicious bunk about Trump and the Russians (Obama caved everywhere to Russia: Ukraine, Syria, missile defence; Trump hasn't). The United States is strung out between the single-payer health-care system Obama wanted, but which Americans don't want, and an elusive alternative that improves health care for low income people, without strangling private medicine and making doctors de facto state employees. No one in the U.S. wants to emulate the Canadian system, which remains a sacred cow in this country, but most Americans are dissatisfied with the very uneven and expensive health-care system they have now, including Obamacare's coercion and rigidity. Obama pursued an America where, as Mitt Romney infamously said, the majority would receive social benefit of some sort from the state. Unskilled foreigners flowed in, food stamp use more than tripled, the average life expectancy in the U.S. declined (slightly), GDP per capita growth flat-lined at under one per cent, the numbers of idle, able-bodied people in the prime of their lives jumped by over ten million, and violent crime rates rose sharply. Obama never precisely defined the society he was seeking, and was fairly popular personally, but enough Americans dissented from the vision and disapproved of the Clintons to give Donald Trump a mandate to stop the advance of the Obama super-state, but without a clear ability to impose his enterprise state. The health-care debate has revealed the weakness of the congressional Republicans, caught between Obama and Trump, disliking (and despised by) both of them. Most Americans are worried at stalled and inept government, a long sequence of fiscal and foreign policy disasters, inadequate education and health care, and terrible abuse of civil rights by prosecutors. It is one of the profound ironies of modern times that the country chiefly responsible for the triumph of democracy in the world is not now a well-functioning democracy. Trump has fought back on health-care reform, threatening defecting Republican senators with electoral defeat through primaries or splinter candidacies; and he appears to have the horses to put through major tax reform. Questions of personality and style, though sometimes grating, like the fantasies about collusion with the Kremlin, don't really matter now. Serious observers should forgo snobbery and realize that the future of America is in the balance. Donald Trump may not be sprinting toward Mount Rushmore, but he is all that stands in the way of a precipitate decline of America from its recent summit as the world's only superpower. Of course, it remains the world's greatest country, and all countries have their ups and downs, but if America continues to flounder, with a free press and legislators that are largely a disgrace to the professed civic ideals of the country, and toward the flabby condition of a welfare state, the decay will become incorrigible. I still believe Trump will succeed, but if he doesn't, the U.S will not be the later Roman Empire, but it could cease to be the great and ever-rising America we knew.